Chippewa River at Dawn photograph for sale as Fine Art. The early morning sun greets the Chippewa River in northern Wisconsin. As the sun rose over the hillside shadowing the river, it lit up the fog rising off it to a vibrant pink, creating a nice, soft contrast with the blue of the water and sky. I was visiting my grandparent's home many years ago; early one morning found me walking down by the river before sunrise, soaking in the peaceful beauty of the morning. The river sat shrouded in a blanket of fog; it was like walking into a cloud. I remember the clean, summer river smells. Frogs were trilling, a distant loon called - its haunting song echoing off the distant shore. I stood enchanted, just soaking in all the things I love about "up north" Wisconsin. Then the sun rose above the hills to the east, and the fog surrounding me exploded into a beautiful, bright orange-pink color - everything was bathed in this awesome light. 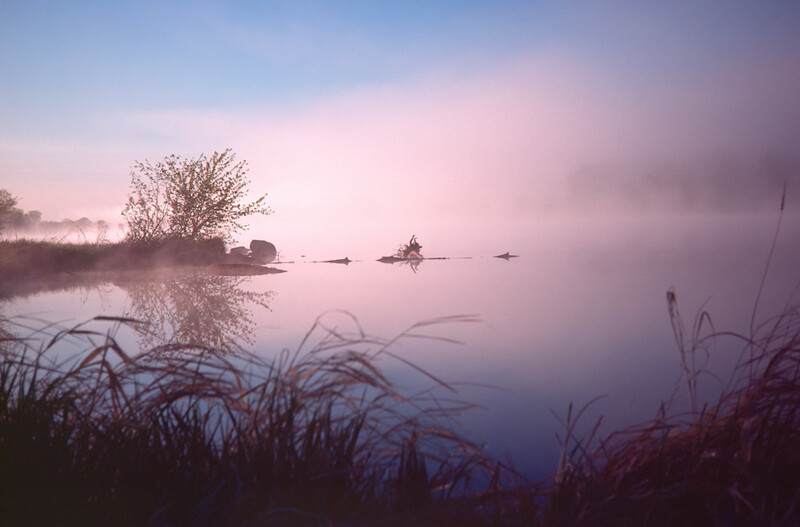 This is one of the later pictures in the series; my favorite because the blue of the sky seen through the lifting fog, and the colors it puts to the river, offer beautifully saturated complementary colors to the still pink fog.